Several members of the International Forum participated in the 21st annual Justice Conference at de Poort, the Netherlands, a Bahá'í-inspired forum for the exploration of international law, global governance, justice and ethics, which draws lawyers and other experts from all over the world. 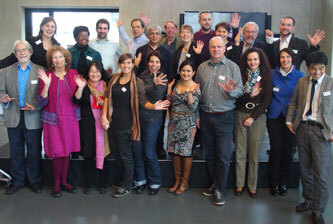 The theme of the conference this year on 25-27 March was "Justice in Action: From Local to Global". Ismael Velasco presented his work on suicide prevention with young people in Greenland, gave a workshop on "The Next 30 Years: Perspectives on Radical Technological Change & the Social Transformation of Justice - Trends, Prospects and DiIemmas", and also entertained with evening story-telling. Sylvia Karlsson-Vinkhuyzen spoke on a plenary panel on "Perspectives on Global Order and the Rule of Law" looking at issues of accountability. Arthur Dahl gave a keynote on "Using the new UN 2030 Agenda to work for justice at the local level". IEF members Nigel Jollands, Wendi Momen and Iko Kongo also attended the conference. 11 March 2016 – The United Nations Statistical Commission today agreed on a set of global indicators that will measure success towards the new sustainable development agenda, which will lead anti-poverty efforts through 2030. On the last day of its 47th session, the Commission approved a draft global indicator framework intended for a global follow-up and review of the Sustainable Development Goals (SDGs). The IEF Governing Board is pleased to announce that Ian Hamilton, the new Representative for Sustainable Development in the U.S. Baha'i Office of Public Affairs, has agreed to contribute his expertise to IEF as a co-opted member of the Governing Board. Co-opted members are invited to join in the work of the board to contribute a particular perspective or diversity of opinion that the board feels it needs, without the right to vote that is the prerogative of elected members of the board. In the United States, people of many faiths, including the Baha'i community, will be celebrating Faith Climate Action Week on 15-24 April 2016 to coincide with Earth Week, including Earth Day on 22 April. Activities are being organized by Interfaith Power and Light, which in previous years held a Preach-In on Global Warming in February. This will be an annual interfaith event aiming to create greater awareness of the changing climate, the challenges it presents, and solutions. The United Nations Environment Programme (UNEP) has quoted from the new Baha'i International Community (BIC) statement for the UN Climate Change Conference (COP21) in Paris. 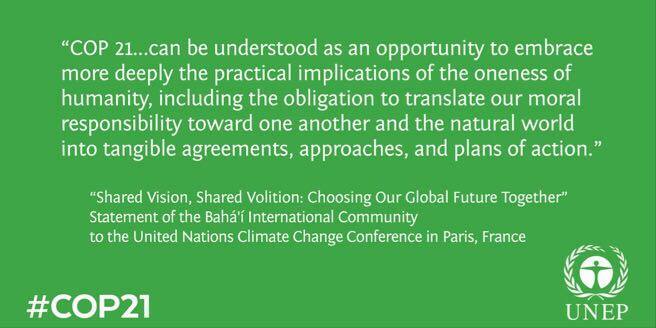 The full statement "Shared Vision, Shared Volition: Choosing Our Global Future Together" is at http://iefworld.org/bic_cop21 or https://www.bic.org/statements/shared-vision-shared-volition-choosing-o…. On 23 November, IEF member Laurent Mesbah helped to organize and moderated a conference in Sarajevo, Bosnia and Herzegovina, on the topic "BiH Road to COP21 – In Anticipation of the World Climate Conference". The Global Research Forum on Sustainable Production and Consumption (GRF-SPaC http://grf-spc.weebly.com/) and the Partnership for Education and research about Responsible Living (PERL http://www.livingresponsibly.org), both long-time partners of IEF, held a joint strategy workshop at the Vienna University of Economics and Business on 20 November 2015. The workshop was hosted by the Regional Centre of Expertise on Education for Sustainable Development Vienna (RCE Vienna) at the Institute for Ecological Economics, and was facilitated by Vanessa Timmer of One Earth and GRF-SPaC (see November Leaves). IEF was represented by Victoria Thoresen, PERL Coordinator, and Arthur Dahl.